You can help end the death penalty in Florida! 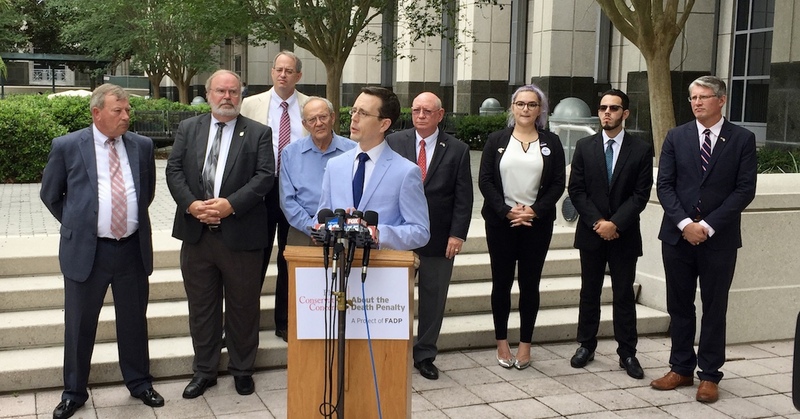 The Florida legislature is now in session, and a bill to end the use of the death penalty needs your help! We need you to contact your legislators and ask them to co-sponsor this important legislation. Ask them to say YES to ending the death penalty. This fall support for the death penalty plunged to its lowest level since 1972. You made that happen. You stood by us year after year, and now even red states and Republican lawmakers are leading the charge. Will you help us continue our work in 2018? Please make as generous a gift as you can. We need to raise $50,000 by December 31st and the first $25,000 we raise will be matched! Last month, an African American prosecutor in central Florida received an especially disturbing piece of hate mail: a racist note and a noose. The prosecutor, State Attorney Aramis Ayala, made national news earlier this year when she announced she would not seek the death penalty in future cases. Her constituents broadly supported the decision, and a grassroots movement sprang up in support. But Florida’s Governor Rick Scott made the reactionary decision to transfer all her death penalty eligible cases to a neighboring prosecutor. The specter of a white Governor stripping the state’s first black States Attorney of almost two-dozen cases for exercising her lawful discretion was discomfiting enough. But that battle is now buried in a thicket of legal arguments. Lest the courtroom drama obscure the obvious racial implications of the entire saga, a noose in the mail brings them back into stark relief. A noose is not just a threat; it’s a symbol of lynchings – which themselves were precursors to the modern death penalty.